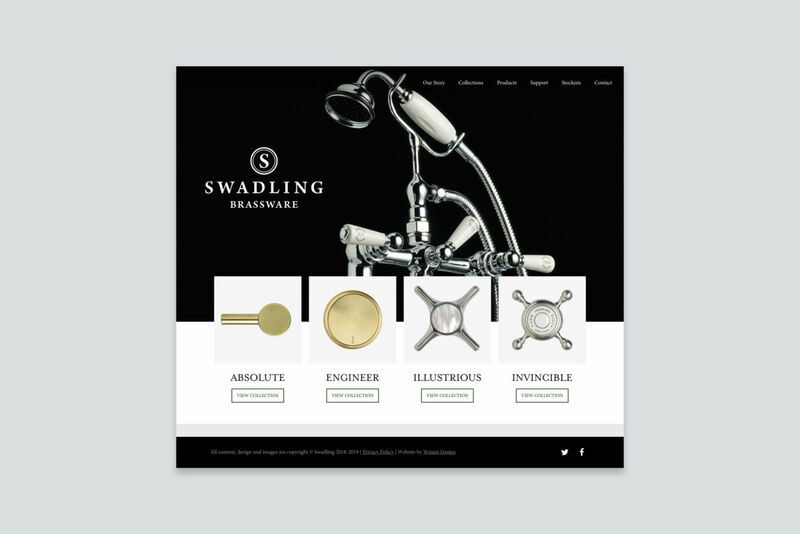 Since launching in the 1970s, Swadling Brassware has gained a shining reputation as innovative brassware experts. 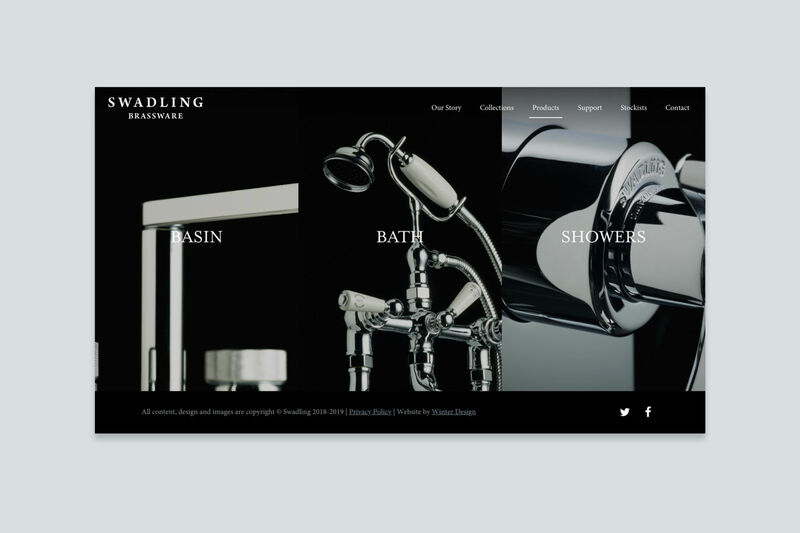 Producing bathroom accessories from their factory in Hampshire, UK, they deliver products with a dedication to quality and careful craftsmanship. It was paramount that Swadling’s new website reflected their industry-leading product range. So when we were asked to develop it for them we concentrated on creating a contemporary, design-focussed aesthetic mixed with absolute emphasis on functionality. 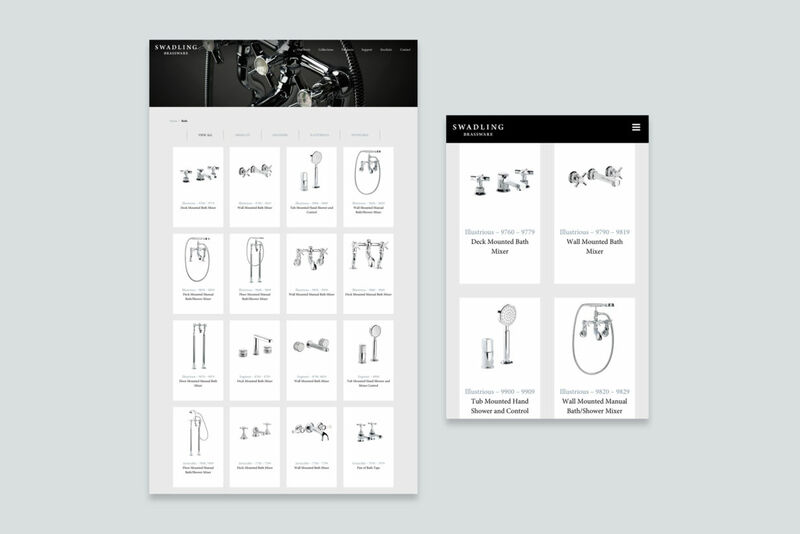 The outcome is easy product browsing, with high visual appeal. The homepage creates a confident and professional first impression, welcoming viewers with a full-width hero image and incorporated brand logo. The viewer can then explore the site via the fixed navigation bar presented across the top of the page, including drop-down menus for added accessibility. 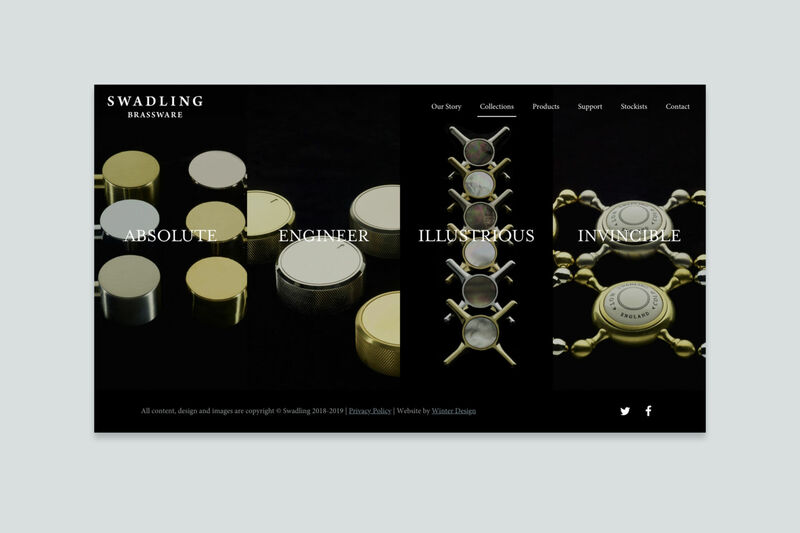 One of the most important aspects of the site is the considered presentation of the client’s stunning products. 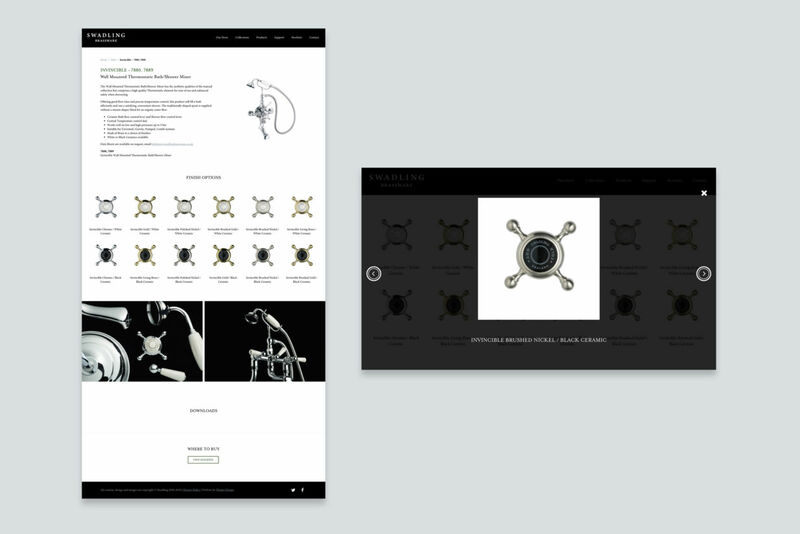 Visitors are given the choice to view items by Collection or Product, with individual landing pages respectively. These greet the visitor with striking images above the fold and animated buttons appearing on mouse-hover, to entice the viewer to delve into the site’s content further. 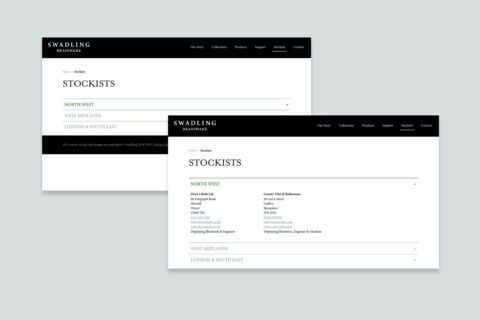 Visitors are then presented with Swadling’s products in a four column grid layout. This is cleverly animated with isotope when filtering products by type, meaning the customer can find the products that are best suited to their needs, in the least possible time. Corresponding product detail pages use a clean layout, presenting an image horizontally aligned with key textual information. Both can easily be edited by the client as they wish. When scrolled, users can view a gallery of finish options which pop up into a lightbox slideshow. 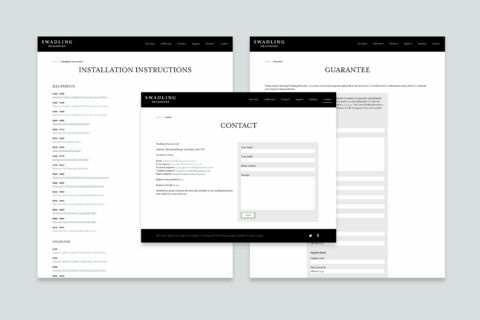 But it’s not just about beautiful imagery – important links to practical information such as installation instructions and stockists are featured below. 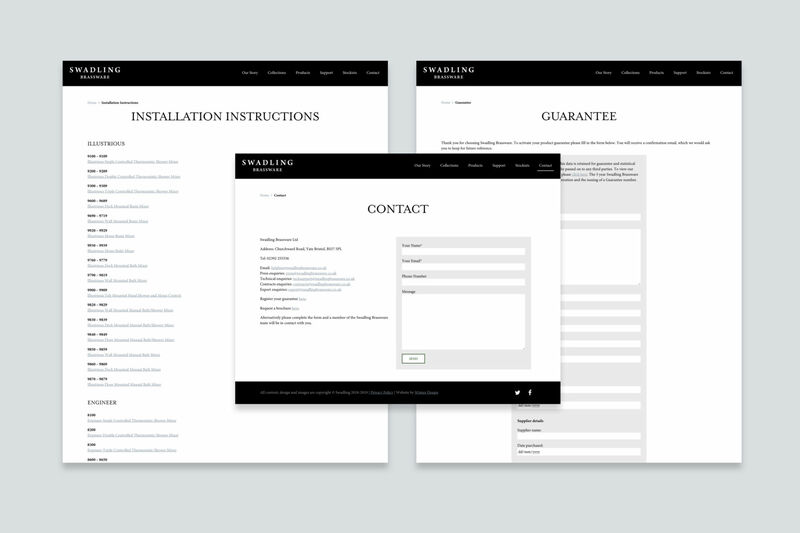 Other site features include a user-friendly contact page and embedded links to direct email for straight-forward communication, stockist information presented as a stacked, collapsible list, and subtly responsive animation used throughout the site for enhanced interest. 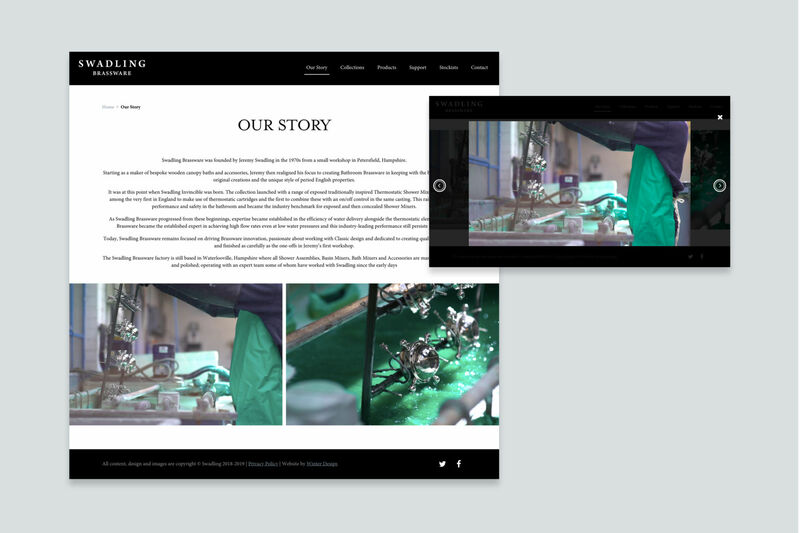 Fully fluid-responsive, the site is optimised for all screen sizes, including smartphones and tablets. As always, visuals are kept crisp by being HD/retina friendly, whilst page load times are kept low thanks to advanced image compression. Visit the site at swadlingbrassware.co.uk.